Attending the "Festival of Dust"
I have been attending the Burning Man festival (Gerlach, Nevada) since 2009. Each year I have gotten steadily more involved both with art and theme camps at the event, as well as local community activities. My biggest year was 2015 where I submitted for, and won!, my first Honorarium grant. 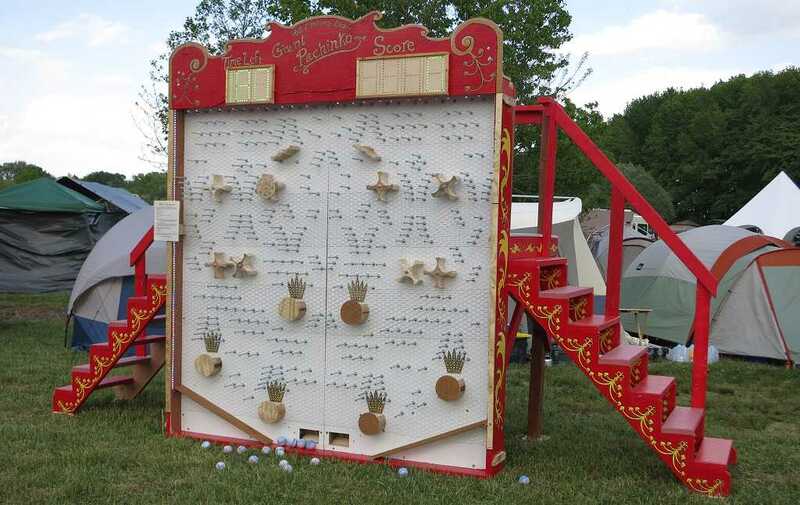 The "Hall of Mirrors Arcade" was a 3 piece larger-than-life set of classic parlor games with the distinct purpose of being not only interactive but also cooperative -- meaning, to play each game skillfully requires at least two people working together. I conceived the idea for Hall of Mirrors Arcade (HOMA) just before Thanksgiving weekend 2014... about 10 days before the "Carnival of Mirrors" theme was announced. This was the major collaborative art project for the Baltimore and DC regional communities for 2015. Approximately 50 people from Maryland, Virginia, DC and Pennsylvania came to our two work sites over the spring and summer of 2015 to assemble and paint these pieces. I received additional art grants and did presentations at: Playa del Fuego (spring), Freeform Arts Festival and PEX Summer Festival before being shipped off to Burning Man. 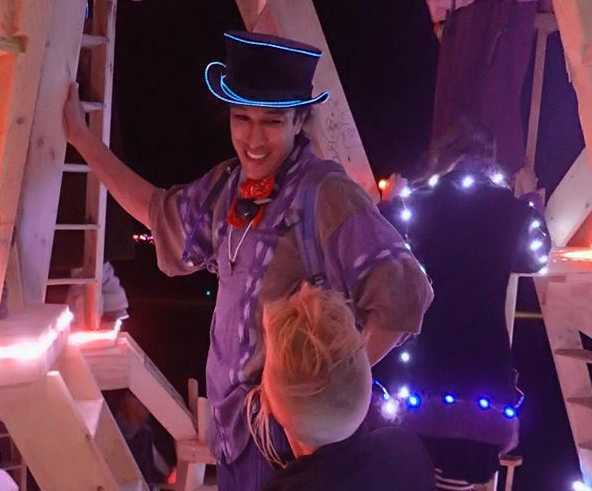 At Burning Man we were given the additional honor of being one of only two Honoraria featured inside the Man Circle. What an honor for our team! (Thank you, BettieJune!) The project was a total success, meeting or exceeding all of our artistic goals. 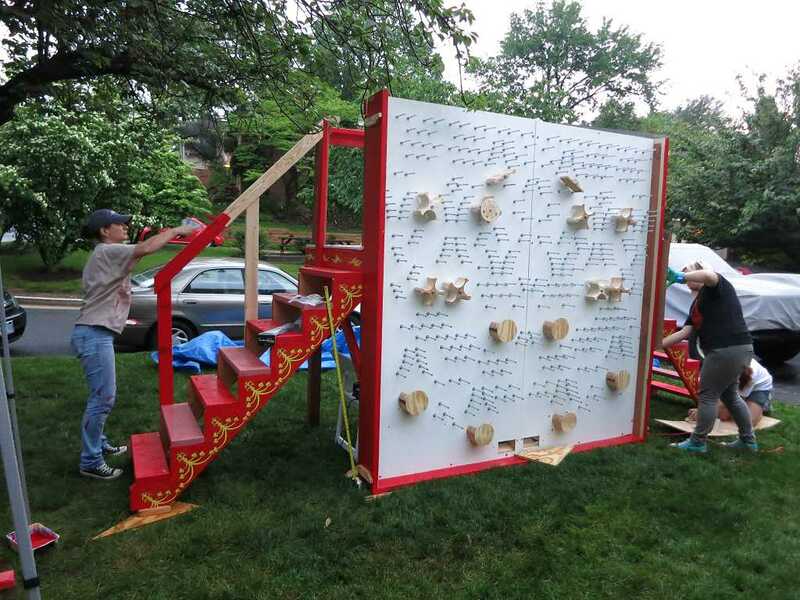 The 3rd piece, "Playa Art Tour" (a marble labyrinth) went on to be displayed at FIGMENT DC and Artomatic. 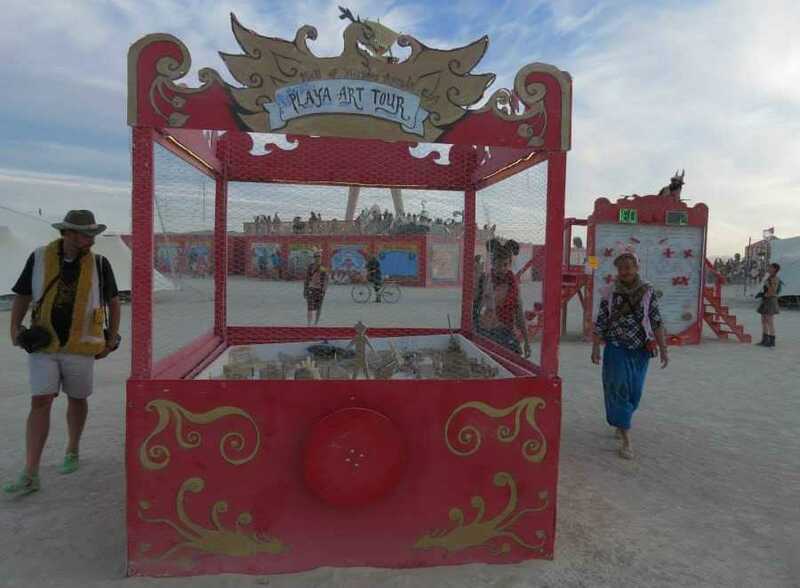 Both "Playa Art Tour" and "Giant Pachinko" are still intact and may make apperances in the future. That same year I was granted a 2nd Honorarium for designing and proposing Baltimore's regional project for the midway: "Macabre Penny Arcade" (MPA). Since I had to devote most of my efforts to HOMA, Ian Scott and Millie McMillan did most of the organizing and coordination of build weekends in Baltimore for MPA. MPA featured three interactive components. In the front you were met by two Zoltar-like fortune teller booths. Instead of a dummy with glowing red eyes, festival participants would walk inside the booths and tell fortunes to those who walked up! These were so popular that each night there were lines of people waiting to have their "fortunes" told. Behind the booths there was a "Pit and Pendulum" game (everything was sort of Edgar Allan Poe themed, as this is Baltimore) and a "Picture Frame Wall" where visitors would pose through faux picture frames, allowing their friends to photograph them. Custom Arduino electronics designed by Arthur Clarke and myself were used on the fortune teller booths to enhance the participant experience. Polygonia (2010) - Doug Taphouse's honorarium, featured at the foot of the Man that year. I worked at many of the build weekends fashioning and cutting some of the 960 pieces. I also custom-fitted four "Man head" pieces with El-wire and custom controllers that would blink at pseudo random times. DC CORE "Pyramid of the Illuminati" (2013) - I was the Construction Lead and Electronics Lead for this project led by Andrei Ponomarev. 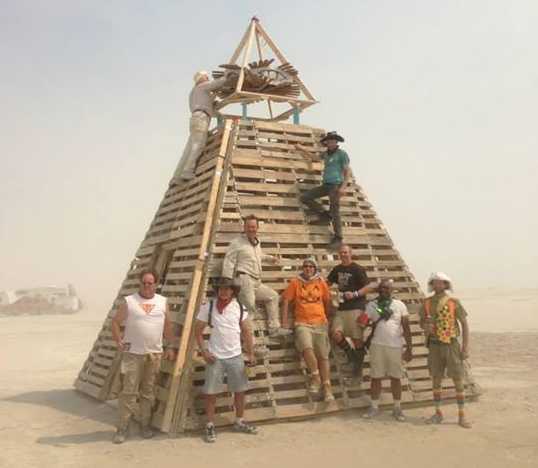 It was a magnificent 21 foot tall pyramid fashioned to look like the symbol found on the back of the US $1 bill. Most of the load-bearing design was my own, based on my experience with deck and house framing construction. I also devised a way to assemble (and disassemble!) the structure so that it would not require any power equipment. 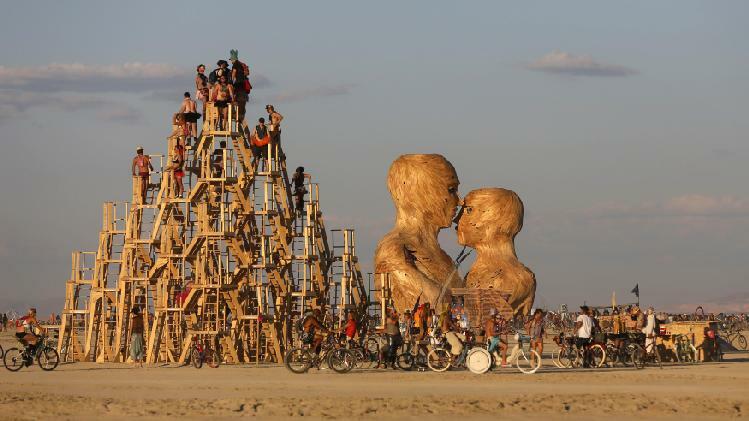 (On playa we ended up asking for a forklift for the eye piece out of concern for safety. And we were all tired by the end of assembly anyway.) The completed structure was safely climbable, featured music and hammocks inside, and had LED lighting on all its outside edges. The primary edge lighting consisted of 2,304 individually programmable LED's powered by dual 350 Watt power supplies. I devised all the power and signal wiring, including a scheme to protect the LED strips from climbers. The controller progrgramming was done by Bill Pugh, Branden Hall and others. Bill did an excellent job tucking and taping all the wiring so that it was practically bulletproof when we were done. The electronics survived five days on the Playa and countless climbers, before being torn apart in preparation for Thursday's burn. Some of the LEDs were later repurposed for DC Burner art displays and then upcycled for use on my "Alpha Wands" project. 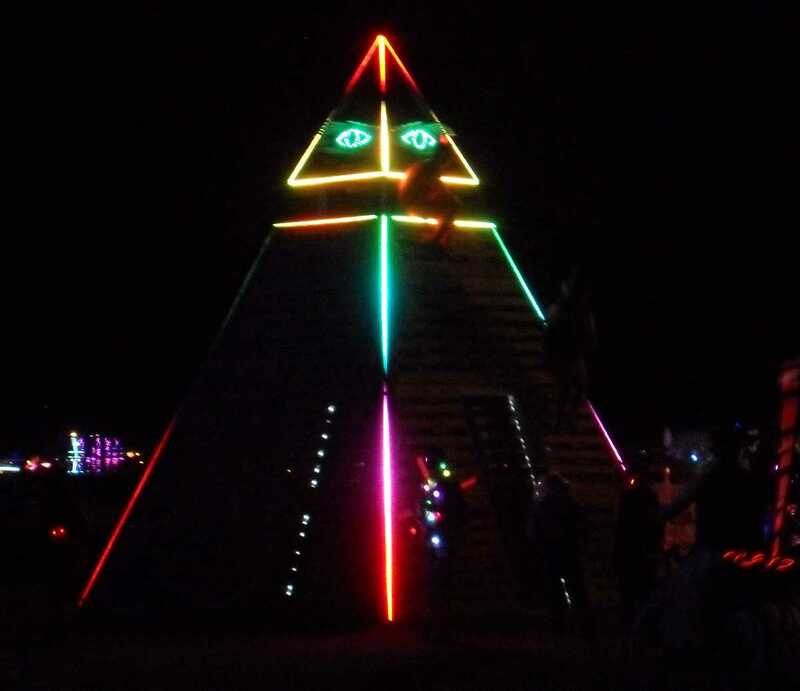 Pyramid of Possibilities (2014) - Doug Taphouse's large-scale art project which should have won an Honorarium grant but didn't. 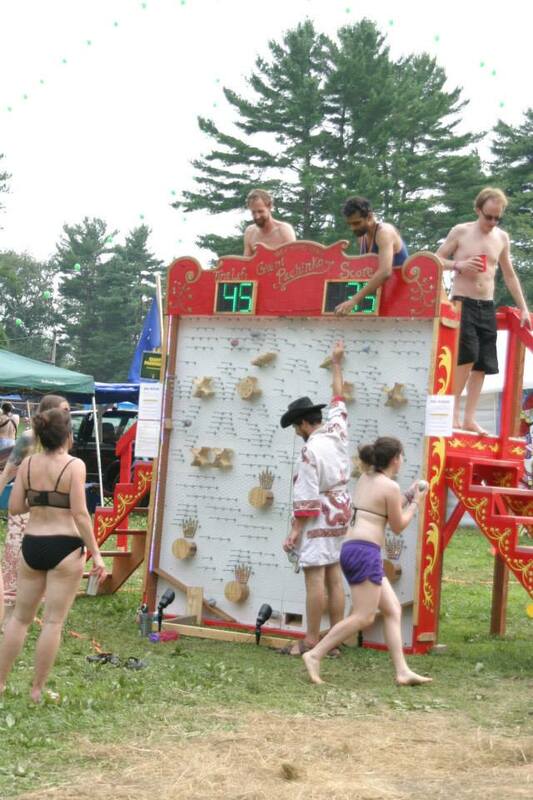 The DC Burner community rallied to raise the $thousands needed for the materials and transport to Black Rock City. I served as a carpenter on most of the build days, and was the Electrical Lead. I designed the custom Arduino-based PC Board that went into each of the 56 platforms. 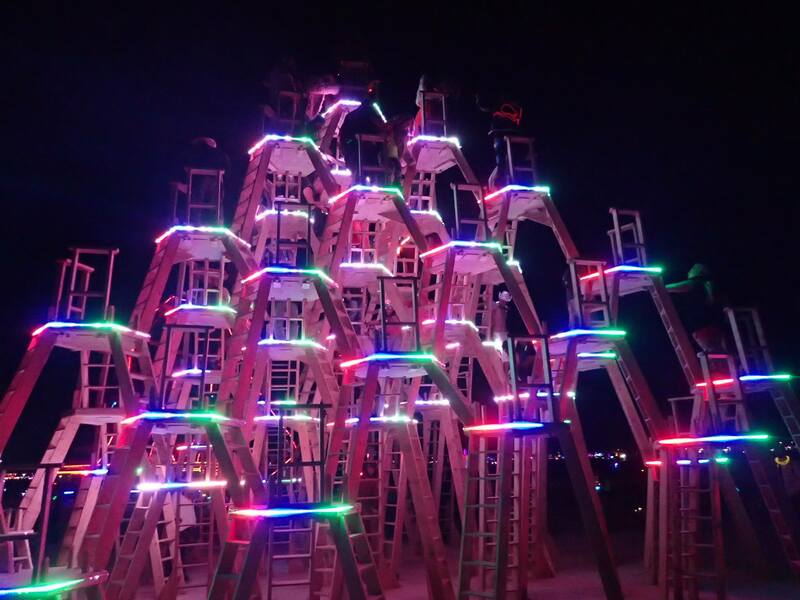 A total of 13,440 individually programmable LEDs were installed across the structure. Each PC Board featured an accelerometer (to detect people walking/stomping on each platform) and an RS-485 interface, in addition to LED strip drivers. 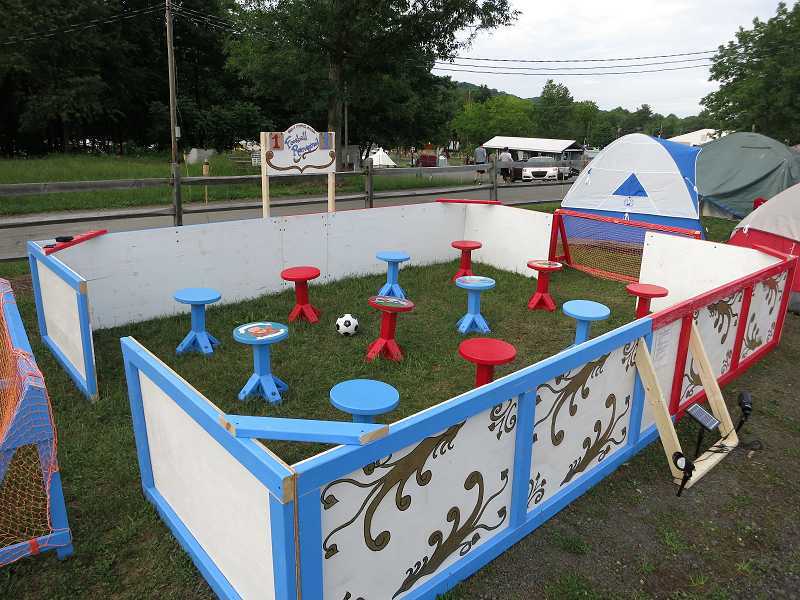 The installation was powered by a 4,000 Watt gas generator. 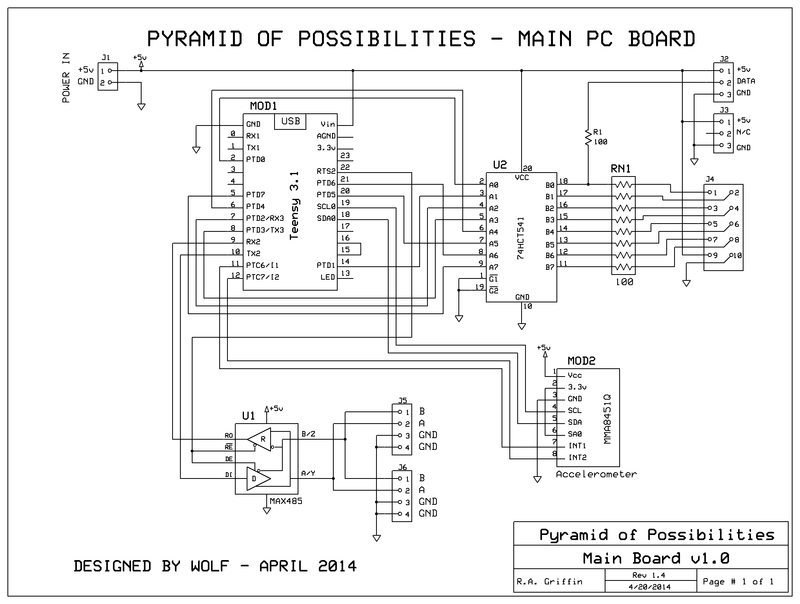 Below are the schematic and the layout for the Pyramid of Possibilities PC Board. The circuit is pretty simple: an octal buffer to manage the OctoWS2811 library output, a high speed RS-485 interface, a 3-axis 14 bit accelerometer, all driven by a powerful 32-bit ARM processor based Arduino. 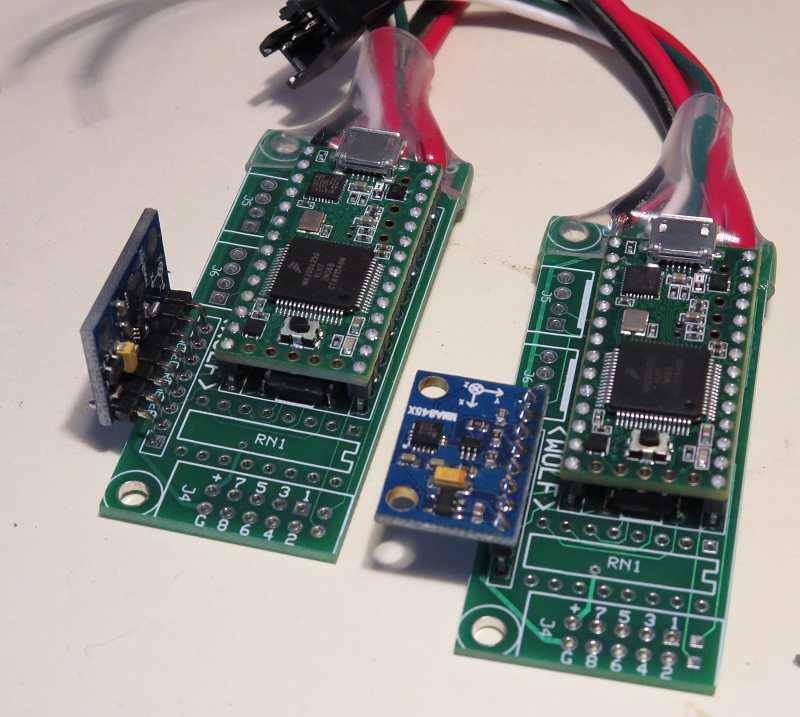 We kept costs down by buying in bulk and getting the accelerometer module preassembled overseas at a cost of only about $1.50 each. The PC Boards were assembled and tested in a big soldering party at Doug's house one afternoon.